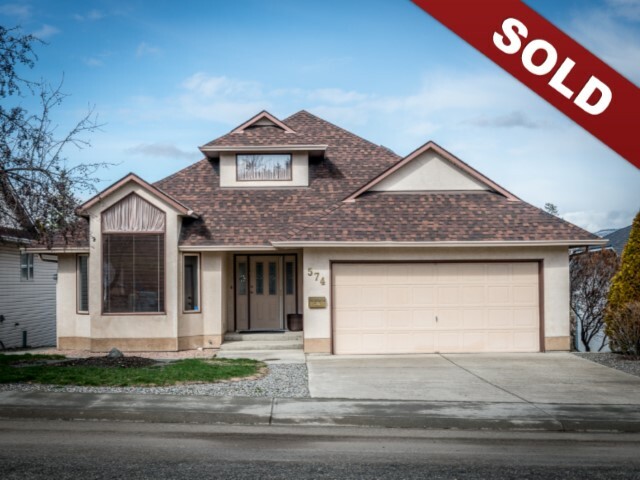 New Listing: 574 Monarch Drive, Sahali, Kamloops, BC $524,900. Awesome family home in a very desirable neighbourhood that backs on to a greenbelt and stream. This home features a grand entry with curved stairway to the second level. The main floor features a vaulted ceiling in the living and dining room with lots of windows. The kitchen has an eat in nook and access to the large deck that overlooks the private yard. There is a bedroom off the kitchen, one could easily enclose that room to make it totally separate from the kitchen space. The master bedroom is on the main floor with a 4 piece ensuite, there is also a 4 piece main bathroom and main floor laundry. The second level features a large bedroom and 4 piece bathroom. Basement is a daylight walk out with separate entry and suite potential. There is a fouth bedroom, family room and large unfinished space open for your ideas! Lots of large windows and second deck under the main deck. The yard is fully fenced, there is a large 2 car garage and room for RV parking. Awesome property with endless potential.